Investors didn't just hit the pause button Wednesday, they hit the reverse one. Backing away from three consecutive record closes, the Dow tumbled about 100 points on Wednesday. The selling didn't appear to be triggered by any specific new concerns, but it does represent a pause from the recent ascent. "Everybody is just taking a breather here. The market never goes straight up," said Randy Frederick, managing director of trading at Charles Schwab (SCHW). The Dow, S&P 500 and Nasdaq all closed firmly in the red. 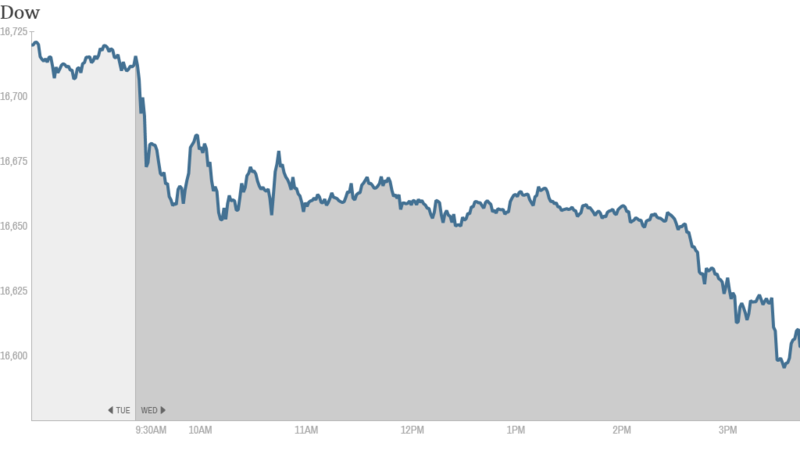 The slide halted the Dow's five-day winning streak. Many of the names leading the drop sell items that are considered discretionary, not essential. A day after losing 3%, Whirlpool (WHR) dropped 4% following a negative analyst report. Shares of Fossil (FOSL), best known for its watches and jewelry, dropped more than 10% as investors expressed disappointment over the company's declining profits and soaring expenses. The maker of the "Grand Theft Auto" video games, Take-Two Interactive Software (TTWO), tumbled 8% as investors lamented a cautious outlook from the company, which overshadowed a solid earnings beat. Rival video game makers Electronic Art (EA) and Activision Blizzard (ATVI) also retreated. "$TTWO Plenty in the pipeline to surprise investors in the coming months. E3 is right around the corner! Enjoy the bargain prices," StockTwits user gambl0r wrote. The retail sector was also in focus, headlined by Sears Holdings (SHLD), with many companies reporting quarterly results this week. 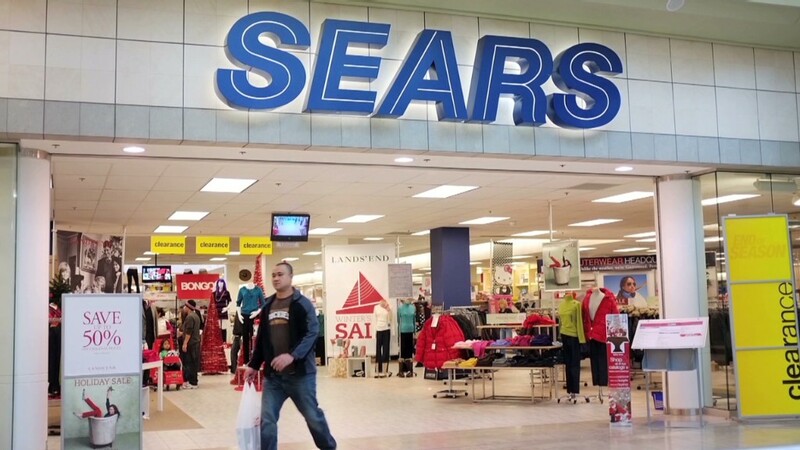 After initially rallying, Sears fell almost 6% after the company revealed plans to either unload its 51% stake in Sears Canada or sell the brand north of the border entirely. The announcement comes as Sears struggles to stem the bleeding in its core business. Macy's (M) was flat today after it announced quarterly earnings that topped estimates by a penny, and slightly lagging sales. On the positive side, the company hiked its dividend by 25% and boosted share buyback plans by $1.5 billion. Wall Street sent Kate Spade (KATE) soaring 8.5% into the green, applauding surging sales. Outside the retail world, tractor company Deere (DE)reported profits and sales that topped forecasts, but the company dimmed its outlook amid declining equipment sales. Sony (SNE) slumped 7% after showing sales rose but projecting a full-year loss of $489 million, its sixth in seven years. Transport stocks, which have recently rallied to record highs, were also a source of trouble on Wednesday. Names like United Continental (UAL), Delta Air Lines (DAL) and UPS (UPS) all lost ground. Retailers Wal-Mart (WMT) and J.C. Penney (JCP) will steal the earnings spotlight on Thursday. Inflation hawks may finally have something to crow about. The Labor Department said producer prices popped 0.6% in April, good for the biggest jump since September 2012. Economists had modeled for a softer increase of 0.2%. Investors will get to see whether or not producers passed those higher prices down to customers on Thursday when the government releases its consumer price index. Meanwhile, bond prices continue to defy expectations by rising. The 10-year Treasury yield, which moves opposite direction of the price, ticked down to 2.53% on Wednesday, touching the lowest level since late October. The lower bond yields should keep a lid on borrowing costs for consumers and businesses alike, but they also signal investor trepidation about stocks. Tech stocks could bounce back on Thursday as Cisco Systems (CSCO)revealed an earnings beat after trading ended. Shares of the tech bellwether climbed 5% in after-hours trading. European markets closed largely flat. Shares of GlaxoSmithKline (GLAXF) moved higher even after China charged a former executive with arranging a bribery scheme.